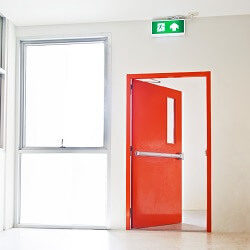 A magnetic door lock can provide easy access while securing a door. This is a great lock to use in a space that needs to be accessed often. Also known as an electromagnetic lock, magnetic lock, or maglock this locking device consists of an electromagnet and an armature plate. There are two main types of electric locking devices. Locking devices can be either “fail safe” or “fail secure”. A fail-secure locking device remains locked when power is lost. Fail-safe locking devices are unlocked when de-energized. Our trained staff will be in your business with as little disruption as possible. We also provide services 24/7 if you encounter an emergency that cannot wait until regular business hours. You may not want to leave your business without security at any time while you are not there, and we can provide the right solutions in an emergency Locksmith situation. A magnetic lock uses state of the art technology, and is strong enough to withhold a great deal of pressure. Locksmith Bee can guarantee the work done will be done right with your satisfaction in mind.